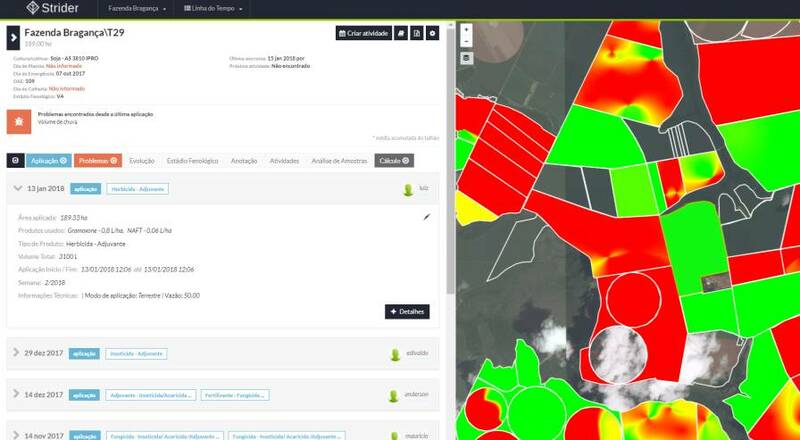 The monitoring of pests and disease on Brazilian farms has evolved from paper recordkeeping (above) to mobile platforms. About nine years ago, shortly after finishing my graduation, my first job was as a monitor of pests and disease in cotton on a farm in West Bahia, Brazil. 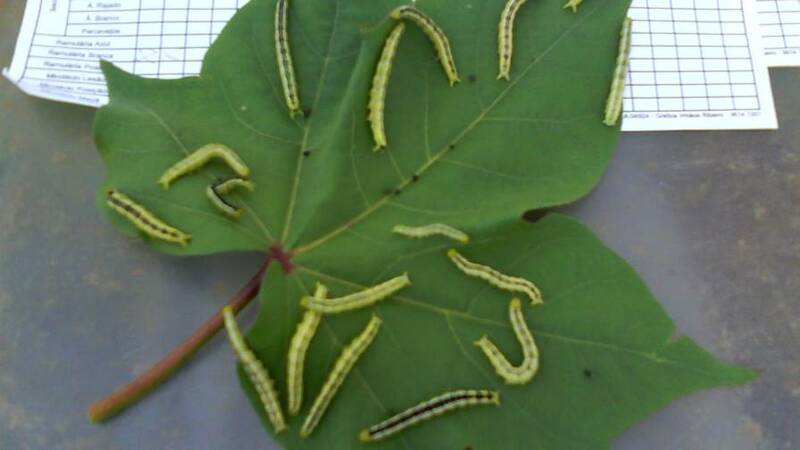 There were 25 young agronomists working on approximately 25,000 acres of cotton, where we monitored 400 acres per day and marked pest and disease rates on a paper chart. After that, these records were posted to an Excel worksheet and sent to the Farm Manager to make the decision of what to do next in that field. Some farms still use this procedure to monitor their fields, but many have evolved a lot in this area. 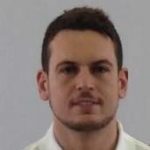 The major disadvantages of this system is that it can’t control the pest monitor in the field, delays the launching and organization of data, and is difficult to create a georeferenced history. Strider shows the history of applications and indices of pests. Click to enlarge. Farmbox uses a pre-determined monitoring trail. Click to enlarge. However, in the last three years the use of intelligent pest monitoring systems have grown significantly. In Brazil, we have two companies that work in this sector: Strider and Farmbox. These companies saw this demand and created monitoring systems that enable a scout to use a tablet or cell phone with a pre-programmed route for monitoring pests and diseases in the field. This has provided agility in data processing and increased control of the operation. In addition, these platforms function as a farm management system, including the entire history of phenology, pests, diseases, and sprays. I have used both the Strider and Farmbox systems on the farms that I have worked on. In my view, the two platforms are very similar in operations and functions, and both are becoming popular in the medium and large farms of different cultures in Brazil. Another great advantage that these platforms offer is promoting the rational use of pesticides. Specifically, where we have an index of economic damage in crops, we can apply insecticides, fungicides, and herbicides only where it is necessary. I think artificial intelligence can help in the evolution of these platforms even further. If the insertion of data were done via voice, it would be much easier and faster than the insertion choosing the pest or disease on the tablet or phone. It is a suggestion for anyone who wants to upgrade these systems. 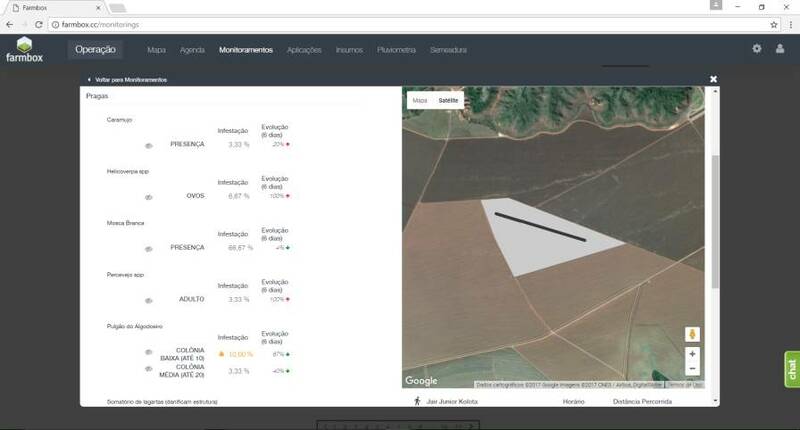 For more information about the platforms, visit strider.ag and www.farmbox.com.br.